What's better than having an outhouse outside? Having one inside, of course! 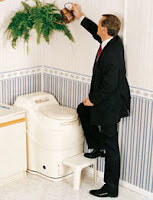 Long considered the standard in composting toilet performance, the Excel is the preferred self-contained electric model for heavy or residential use. The Excel is not only our best-selling unit, but also the first self-contained composting toilet to be certified by NSF (National Sanitation Foundation) in 1989. The Compact is an elegant low profile unit with the looks to complement any bathroom. 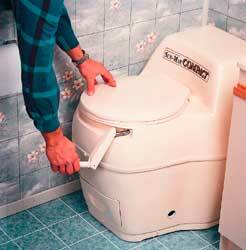 Sun-Mar engineers designed this low profile toilet by developing and patenting a new variable diameter Bio-drum which is small at the front and large at the rear. To maintain the uninterrupted lines of the Compact, a patented Bio-drum handle recesses into the body of the unit to mix and aerate the compost. 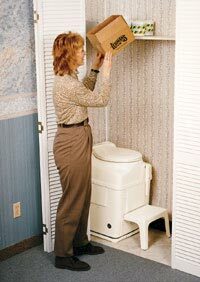 With a width of only 19" and depth of 22", even a closet or small corner can be turned into a bathroom! The Space Saver is a standard three chamber unit designed specifically for situations where space is extremely limited.